My name is Gwen Rummler. I work at the LSG Sky Chefs facility in Munich, Germany, as Assistant Operations Manager HACCP. I am responsible for all of the HACCP Documentation in our production area. Before moving to Germany from Canada in 2000, I had never been to a Christmas Market. Unbelievable, right??? The closest thing I had ever seen to a Christmas Market was the Festival of Lights in Niagara Falls. Was I in for a surprise! When the Christmas Markets open at the end of November, people from all over the world flock to them. Some people go to meet friends for a steaming mug of mulled wine, while others go to find unique gifts for Christmas such as sheepskin rugs and slippers, beeswax candles, glass baubles, wool hats and sweaters and a huge variety of homemade jams and chutney. I go purely for the food! Every market offers a mouth-watering selection of local specialties. While sipping my mulled wine spiked with amaretto, I wander around and decide what I’ll eat next! Will it be a steak bun? Pulled venison? Or maybe a wild boar burger? The scent of cinnamon, cloves, roasted chestnuts, warm, sugary almonds, crepes and Sausages permeate the Markets. One of my favorite markets in our area is also the biggest market in Munich, Germany. The market is held in the very impressive city center square, Marienplatz, boasting 1500 wooden huts selling Bavarian handicrafts such as wooden nativity scenes in all sizes and a 30 meter tall Christmas tree lit by 2500 candles. My all-time favorite, as well as my parents favorite (who came to Germany for a visit) is the Medieval Christmas market located at one of the most beautiful locations in Munich at Wittelsbacherplatz. Vendors are dressed in medieval garb, music from the 11th-16th century plays in the background, and sometimes if you’re lucky you may even see a real knight walking around with his very real sword! What I really love about this Christmas market, and I’m sure my husband and parents would agree with me, is the suckling pig roasted on a spit. I never leave without getting a pork bun! Lots of food specialties here, such as flatbread with bacon and onions, freshly baked Steynbrot, and a Celtic spit with either beef, pork or chicken. 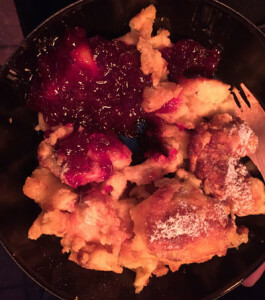 For dessert I usually order Kaiserschmarrn (chopped pancake with applesauce or wild cranberries).